The Australian Open of 2012 has ended. World number one Novak Djokovic won the title in Men's Singles whereas Victoria Azarenka of Belarus won the Women's singles. India's Leander Paes and Czech Rodek Stepanek won the Men's Doubles. Read more in the article. The curtain of the first Tennis Grandslam event of this season has been brought down. The Australian Open of 2012 has ended. The 100th edition of the tournament was taken place from 16th to 29th January. The event witnessed new champions and emerging stars and a few disappointments as well. Defending champion and World No. 1 Novak Djokovic was crowned the champion in Men's Singles beating second seed Rafael Nadal of Spain for 5-7 6-4 6-2 6-7 7-5. It is the third Australian Open title of the Serb and 5th Grandslam in total. The final lasted five hours and 53 minutes and created new records in the Open history. It is the longest match in the history of Australian Open. The match was also the longest Grand Slam final replacing the 1988 US Open final between Mats Wilander and Ivan Lendl, which was 4hr 54mins long. Nadal had beaten former champion Roger Federer in Semis. Victoria Azarenka of Belarus became latest grandslam tournament champion defeating Russian Maria Sharapova in straight sets in the Australian Open final. 22 years old Azarenka also replaced Danish rival Caroline Wozniacki as the no. 1 in the WTA rankings with the 6-3, 6-0 victory. Wozniacki had earlier lost to Kim Clijsters of Belgium in the quarter finals. India also had something to be proud of in the tournament. Indian Leander Paes and his Czech partner Radek Stepanek defeated World No.1 pair Bob and Mike Bryan brothers in the men's doubles final of the Australian Open. Paes and Stepanek won the game for 7-6 (7-1) 6-2. Paes also completed a career Grand Slam of doubles titles with the win. 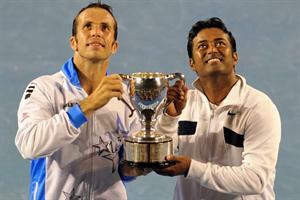 This was Paes' first Australian Open title and the first title with Stepanek as well. Paes paired with Stepanek early days of this year after splitting up with his former partner Mahesh Bhupathi. Bryan brothers would have become the most successful men's doubles team in Grand Slam history, if they won the trophy. They were playing for their 12th Grandslam title. They are now equal to the record of Todd Woodbridge and Mark Woodforde's total of 11 grandslam titles. Leander Paes won his 7th doubles title and 13th in overall including 6 mixed doubles titles. But Paes could not taste the victory in Mixed Doubles as he and his partner Elena Vesnina finished as the runners up of Australian Open. In the final took place on Sunday, they lost to Bethanie Mattek-Sands and Horia Tecau pair. The American-Romanian duo beat the Indo-Russian pair for a score of 6-3, 5-7, 10-3. This was the first grandslam title for the pair. Also it was first ever Grandslam final for Mattek-Sands whereas 3rd for Tecau. Earlier the duo beat the Indian pair of Sania Mirza and Mahesh Bhupathi in the Semi finals. In the Women's Doubles, the Russian pair of Svetlana Kuznetsova and Vera Zvonareva defeated the Italian duo of Sara Errani and Roberta Vinci for a score of 5-7 6-4 6-3. This is the first Grandslam win for the Russian duo together. Kuznetsova has won 2 Grandslam singles also. Errani and Vinci were playing their first Grandslam final together as well. Read the news about forthcoming Australian Open here. The Australian Open 2012, the first Tennis grand slam tournament of this year is commencing on January 16th. The tournament will last to 29th January. India's hopes lie on Leander Paes, Mahesh Bhupathi, Rohan Boppanna and Sania Mirza. Today, one of the most known rivals of tennis Rafael Nadal and Roger Federer were again head to head in the semi-final of Australian Open tennis tournament. Finally, it was Nadal who won the battle but the match was really a treat to watch for every tennis lover. I am here giving the review of major key highlights of this marathon match.